buttermilk recipes | Indian recipes using chaas, buttermilk. Chaas is what buttermilk is called in India. Mostly it's drunk as a accompaniment during lunch or dinner or also could be had as a breakfast drink. Now, we find lots of people carrying chaas to work in a thermos and having it as a healthy snack at work during the day. It's quick to make and stays well in the thermos for the whole day. Look below for the benefits of chaas. We have a nice collection of chaas recipes for you. There is the regular chaas recipe which is what is mainly made as an everyday drink. Then there is the Punjabi mint chaas recipe which has lots of pudina added to it. Want it spicier, try the masala chaas recipe. For daibetics, weight loss and heart patients we strongly suggest you have the low fat chaas recipe made from low fat curds. Since it aids digestion, it is often served along with a traditional Indian lunch. Yes, we use curd in South Indian recipes. The famous quick rava idli recipe uses chaas to get that lovely sourness taste to the idli. The combination of sama and rajgira flour gives rise to a sumptuous Farali dosa recipe that is sure to please your palate on a fasting day. Sour buttermilk is added to the batter to help in fermenting. The fermentation time is just two hours, so you do not even have to plan for this dosa the previous day itself. More Kuzhambu, South Indian Doodhi Buttermilk Curry recipe is the South Indian counterpart to Kadhi. Here doodhi is cooked in a coconut paste with buttermilk. Buttermilk rasam recipe is a ‘light’, moderately spicy rasam that can be safely consumed even by those with cold or fever for whom raw buttermilk is usually not allowed. It tastes best when drunk as it is, while it can also be served with rice and a spicy curry. Sour curds, buttermilk is used in Gujarati cooking from dhoklas, sweet drinks to kadhi. An equivalent to lassi is Piyush, a Gujarati drink. Piyush tastes like nectar, and nothing short of it, especially on a hot summer’s day when you are on a fast. This faraal recipe keeps you full for quite some time, as it is made with sumptuous ingredients like shrikhand and fresh buttermilk. Buttermilk or chaas help in digestion as it has very good bacteria. Probiotics in chaas acts as a mild laxative but, in case of diarrhoea and dysentery, it is a boon, if chaas is used with rice.They help in weight reduction, good for your heart and build immunity. The only difference between buttermilk and low fat chaas is the fat level. Read the benefits of curds to include in your daily diet. 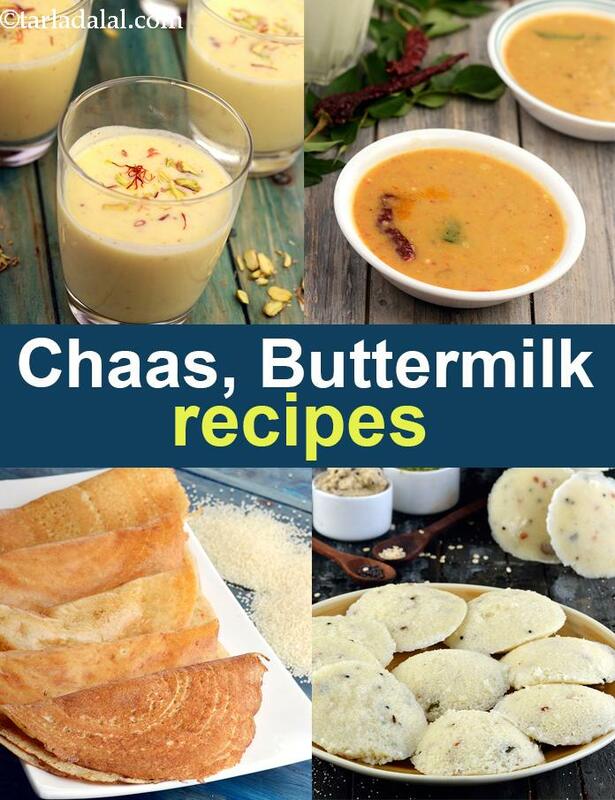 Enjoy our buttermilk recipes | Indian recipes using chaas, buttermilk. Well, you love idlis, but what if you have no batter on hand? here is a quick and equally tasty (in fact, spicier!) version of idlis made with semolina. Since the batter requires no fermentation, this recipe is a quick-fix! for extra zing, add a little grated ginger to this dish. Buttermilk with a difference. . Flavoured with mint and coriander and spiciness added using green chillies. A delicious south indian rasam recipe. . Serve this piping hot with rice or idlis! This subzi goes equally well with plain chapatis as well as rice. to have with rice, retain a little amount of buttermilk as the gravy. addition of peanuts enhances the flavour of this subzi. when tired of eating the usual spicy food, the subzi is a welcome change. This biscuits are soft and not like our Indian biscuits. you can eat'em as snack too. do not overdo this biscuits as they do not taste good. Imagine the crispines of onion rings fried in a buttermilk based batter and try out this Buttermilk fried onions recipe. The onion rings have a delicate tangy flavour with te crispy texture and make for a delicious side dish or topping. A delicious cake for when strawberries are in season. This is a variation of the classic version of the famous Mashed potato that can be used as a relish with any main course or sides/snacks or even alone like this. This is a very tasty dish, prepared with moong dal sprouts cooked in thin buttermilk along with few spices.